Seigle's Cabinet Center is the only distributor to stock all the necessary inventory and has our own fleet of trucks in order to control the timeliness of delivery. Seigle's handles the best brands known for their consistent performance, quality, selection and value. 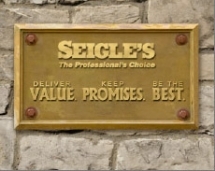 Seigle's philosophy is simple, Deliver Value - Keep Promises - Be the Best. It is your assurance of competitive prices, quality product, and unparalleled service. Seigle's carries the best kitchen and bath cabinetry brands in a wide array of styles, from stock to semi-custom and custom, as well as full-access European frameless cabinetry. Look to Seigle's for a cabinet solution for every kitchen and bath decor, style and budget, in the latest color trends, styles and finishes.